At Cadwell, Glen English (25) makes the save of the day as his front wheel tucks under in pursuit of eventual winner Dean Stimpson (78). Chris Firmin (1) has the best view of it all! Rounds three and four of the 2017 Lansdowne series were at Cadwell Park (June 3/4) and Castle Combe (July 8/9). It’s not often you can visit Cadwell and be blessed with sunshine but this time we were lucky and after taking to the track for the practice/qualifying session, it was Dean Stimpson, leader in the Bonhams Championship, who took pole on Nick Izzard’s Manx, with Glen English second on the SCC Works Manx, third Mike Russell on Richard Adams’ Manx, followed by current champion Chris Firmin on the number one plate ACR Manx. All these riders were lapping in the 1m 45s – close racing at the front looked on the cards. 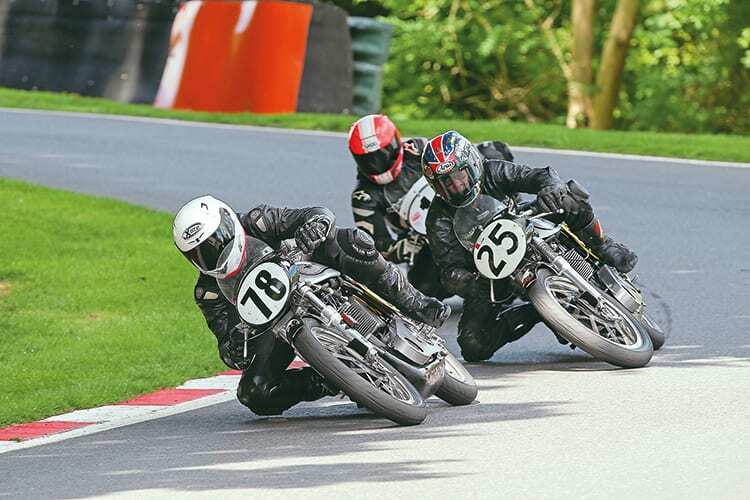 The museum’s WRR Championship saw Mike Farrall head Ian Bain and Chris Bassett, all Manx, with last year’s champ Seb Perez next in line on his G50. Read more in the October issue of TCM – on sale now!